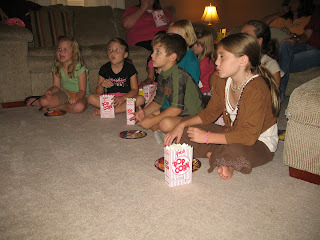 On Friday we were invited to a High School Musical 2 world premier party at Kaylee's friend Kayden Fletcher's house. For those who do not know, High School Musical is a movie made by Disney and this was the sequel that all little girl's have been counting down the days until its debut. 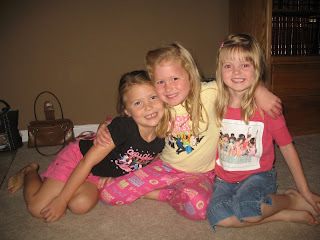 We had such a good time at the Fletcher's house, the night began with a little High School Musical and Hannah Montana karaoke and all kinds of snacks, complete with real movie popcorn boxes, cookies, chips and even a High School Musical cake. The girls (& one little boy) really enjoyed the movie and spending time together. I think all the Mom's enjoyed their selves too! Thanks again to Wendy and Kayden for inviting us! We made it!!!! Kaylee did great and I was....well....ok so I cried all the way to work. She woke up this morning and was ready to go. At ten after 7:00 she was wondering why we still haven't left yet, I had to remind her that she didn't have to be a school until ten til 8:00. So we get there and she would not let me carry anything and she walked about 10 feet in front of me like she was walking in a marathon, we get to the front door and I ask her to turn around and let me get a picture and I get"Momma, come on!!!" We get to her class unload the backpack and have to sharpen a pencil with the cool pencil sharpener hanging on the wall, to which this afternoon when I saw her she told me that the pencil that we sharpened didn't work. I still haven't figured out what didn't work about a #2 pencil but you know.... what do I know! I stayed until the annoucements where completed and until after the pledge of allegiance and moment of silence. And yes, they still do the pledge of allegiance...THANK GOD! Mom picked her up at noon and I went over and had lunch with them. She told us that they got to go on a tour of the school, they went to the Principal's office, "He has a camera on his computer and he can see everywhere in the WHOLE school! ", then they went to the cafeteria and the gym and then to the "book center". I asked her the book center? she said, "Yeah they have tons of books in there and some teachers are there too" I said do you mean the library? She said, "YEAH, the library and there was a little girl that I had to help keep in line, I don't think she had ever walked in a line before." She also ate lunch in the cafeteria today and got to see a lot of her friends in there and got to drink "chocolate milk". At the end of the day she received her blue penny, which means she was good and that her horse didn't get moved to the barn!!! It is just so hard to believe that the "baby" chapter of her life is complete, it seems just like yesterday. We went to open house tonight and man I wanted to cry. 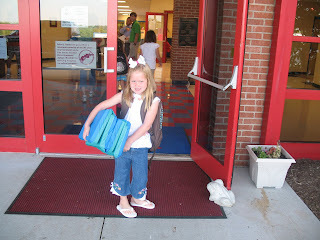 I just can not believe it is already time for her to start school! 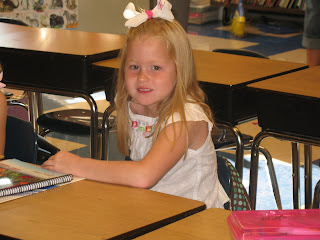 But the big smile on Kaylee's face and then when she said, "Momma is this really MY desk at big school? 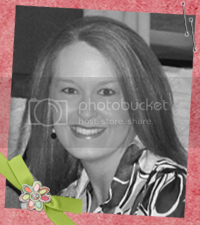 ", I couldn't help but smile back and reasure myself that she is more than ready for school. She recieved her agenda tonight and she thinks that is the coolest thing ever, and oh yeah....kindergartners now get to check out libary books and "bring them home for a whole week!" Now that is exciting, I don't remember getting to check out libary books until like the 4th or 5th grade, times have really changed! Mrs. Bean told us that they would start learning to read around November....WOW!!!!! Can you imagine Kaylee reading, I guess we better stop spelling things that we don't want her to hear now, couple of more months and she will be telling us what we are spelling. So, Monday is the big day, check back to see how it went. Please keep me in your prayers, Lord knows I will need it I will probably cry all day long!! 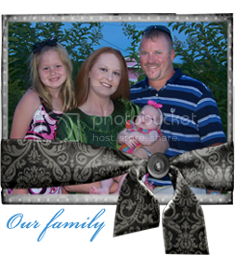 Please leave me some comments as to how you handled your childs first day of school, I would love to hear your stories.